The University of Michigan is seeking a $9 million expansion and renovation to Schembechler Hall, a South Campus facility that is used by the football program and houses the school's sports museum. 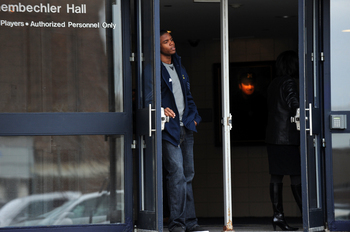 Michigan football player Brandon Herron holds the door to Schembechler Hall open for his teammates. U-M officials will seek permission for the project, which will be supported by athletic department funds, from the U-M Board of Regents at the monthly meeting on Thursday. The proposed project will create a new entrance to the building, adding about 7,000 square feet. An existing 7,000 square feet will be renovated during the project. The building currently contains locker, meeting and medical treatment rooms, training and weightlifting areas, administrative offices and the Margaret Dow Towsley Sports Museum. It also is used for football program news conferences. The renovation will moderately affect parking, taking seven spots off-line. The school has tapped Grand Rapids firm Integrated Architecture to design the project. Tue, Jan 17, 2012 : 2:15 p.m.
Are my eyes falling over or are all the comments on this story italicized? Tue, Jan 17, 2012 : 5:09 p.m. Your eyes are correct, but it's because this article is a about a sophisticated university - a little elegance is needed. Tue, Jan 17, 2012 : 8:23 a.m.
Misery for the rest of the state don't correlate to hard times for the University of Michigan. All professors and administrators should take pay cuts and building that is not essential should be eliminated so that tuition is not raised one dime. Some of the &quot;liberalism&quot; reached at Michigan should be manifest in shared sacrifice form all. But guess what? It ain't gonna happen. Tue, Jan 17, 2012 : 5:38 a.m.
What's the point of having a museum in a building that's posted &quot;Authorized Personnel Only&quot;? Oh my goodness! A Wolverine am I to the core, but can the football program take a break from construction for at least a couple of years? Tue, Jan 17, 2012 : 1:02 a.m.
Michigan Football is more about the PAST than the future so, it is a great idea to remind people of what Michigan Football used to be (or what you thought it use to be). Tue, Jan 17, 2012 : 5:06 p.m. In the olden days, the crowds sang 'Yellow and Blue' at the games, and following a 128-0 drubbing of University of Buffalo by Michigan, the phrase 'getting Buffaloed' became popular. Mon, Jan 16, 2012 : 11:07 p.m. I must be getting old....it seems like Schembechler Hall was only built a few years ago. Mon, Jan 16, 2012 : 11:46 p.m.
Wow Marshall......22 years?? The gravitational pull of the end of days is tugging harder and harder....does time stand still on Hale-Bopp? Mon, Jan 16, 2012 : 11:41 p.m. I believe it was built in 89-90, so 22 years. It's probably due for a facelift. hey! I have an idea they have about 25 millions in outdated musical instruments that are just gathering dust? Sell those the university don't doesn't care about them anyway. Mon, Jan 16, 2012 : 10:14 p.m.
Too bad they can't spend money like this protecting the musical collection that was just reported on here. Tue, Jan 17, 2012 : 3:06 a.m. I'm with you on this Ron. Mon, Jan 16, 2012 : 10:12 p.m.
Look for Schembechler Hall to renovated every 4 to 6 years. The good news is, the Athletic Department can afford it. I am sure this announcement will cause an uproar but the focus will be on facilities in all of major college sports. It is part of the Arms Race. Don't forget about the renovations at Yost Ice Arena. We all just saw Crisler renovated but it really needed it. IMHO, so be it. It will pay for itself. Mon, Jan 16, 2012 : 10:05 p.m.
Take heart season ticket holders. Soon there will be no more land for the U of M to build on. Mon, Jan 16, 2012 : 10:16 p.m.
One day in the not too distant future, U of M will own ALL of the property along the west side of State Street from the RR tracks to Oakbrook Ave.